Acer has outed the TravelMate X313, a Windows 8 convertible that turns into a fully fledged PC when slotted into its accompanying dock. It's something we're seeing more of these days, with Microsoft's Surface 2 Pro 2 tablet and Acer's own Iconia W5 and Aspire P3 devices offering similar functionality. The X313 can be held in the hands and interacted with using its 11.6-inch, 1366 x 768 pixel-resolution display or slotted into a keyboard holder to be used like a laptop. Under the bonnet is a third-generation Intel Core i5 or i3 processor, 60GB or 120GB internal storage, up to 4GB RAM and Intel's HD Graphics 4000 GPU. Acer is claiming up to eight hours' battery life in the absence of Haswell. 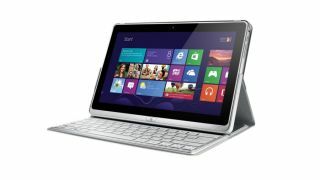 Acer says the tablet is suitable for senior management due to its "robust and solid" aluminium body, the inclusion of Windows 8 Pro and bundled security tools that include face recognition software and anti-theft technology. Other features include Acer's Touch Tools that assist with drawing on photos, ScreenGrasp software for capturing images with a digital pen and AccuFinger that helps with selecting smaller elements when prodding at the screen. It can be picked up now at a starting price of €999 (£835, or US$1,352).